With Member States in the United Nations General Assembly attempting to block the creation of the mandate of an Independent Expert to tackle violence and discrimination based on sexual orientation and gender identity, a joint committee of UN human rights experts warned that the action can have a very harmful impact on the work of Human Rights Council. According to the Coordination Committee of UN Special Procedures – the general name of the independent fact-finding and monitoring mechanisms of the Geneva-based UN Human Rights Council ¬– the attempt to challenge the mandate undermines the Council's credibility and authority, and weakens the human rights system as a whole. In addition, the situation might affect the mandate of the Independent Expert and also special procedures, the largest body of independent human rights experts in the UN system. Today in New York, delegations in the main UN General Assembly body dealing with social, humanitarian and cultural issues (Third Committee) are considering a resolution to block the mandate, which also proposes to delay the mandate, pending further consultations on its legal basis, according to the experts. The Coordination Committee is concerned that such action might place the mandate in a legal and political vacuum, and stresses that creation of special procedures mandates falls within the mandate of the Council. At least 57 mandates have been established by the Council and the former UN Human Rights Commission to address emerging issues. Over the years, the immediate implementation of such decisions was one of the strengths of the Council, allowing it to respond to human rights developments and challenges in a timely manner. The new mandate came into effect on 1 November 2016, with Vitit Muntarbhorn named as the first UN Independent Expert on the Protection against Violence and Discrimination based on Sexual Orientation and Gender Identity, and the Committee is convinced that he will provide the Human Rights Council and Member States with the necessary independent expertise to pursue its discussion on this matter. As such, the Coordination Committee calls on all States to recognize their responsibility to preserve the human rights system and ensure that the Independent Expert is able to continue fulfilling his mandate without hindrance and with the full cooperation of all States and other stakeholders. The Coordination Committee is a body of six independent experts which coordinates and facilitates the work of special procedures as a whole. It is currently composed of Ms. Yanghee Lee (Chair), Juan Pablo Bohoslavsky, Maud De Boer-Buquicchio, Catalina Devandas Aguilar, Dainius Puras and Michael Addo. 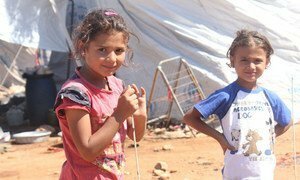 Highlighting the plight of millions of children around the world, the head of United Nations Children's Fund (UNICEF) has called on everyone to recommit themselves to protect the rights of every child.